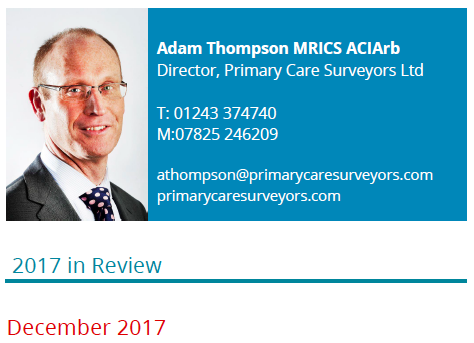 The revised NHS Premises Directions that govern the payment of notional rent and rent reimbursement to GP practices are still long awaited. These were meant to have been published over two years ago, with a further promise when this did not happen that they would be published in the autumn of this year – but still there is no announcement. The reason for the delay is open to speculation, but it would appear to be related to the Estates and Technology Transformation Fund (ETTF) and, in particular, how this funding is to be applied to premises with regard to rent abatement calculations. There may also be changes due as to the procedure for dealing with rent reviews for those premises that are leased. If so, hopefully the requirement for there to be a signed Rent Review Memoranda for the tenant (GP practice), committing to an increase in rent before knowing what the reimbursed rent will be, will be revoked. NHS Property Services tenants in health centres are still without leases, although there does seem to be growing impetus by NHSPS to get these leases into place. In the GP Forward View there was an undertaking that should these leases be entered into by November 2017, there will be a contribution towards Stamp Duty Land Tax and legal fees – but, as so few of these leases have been completed, it is anticipated that the deadline for this financial package will be extended. (This may be covered in the revised NHS Premises Directions when published.) The thorny issue of service charges for health centre occupiers is ongoing, although the implications are that there may be a slightly more pragmatic view to be taken to encapsulate these as part of the lease negotiations. Ownership of surgeries within Partnerships is sometimes proving to be challenging and can be frustrating Partnership changes. With the prevailing low level of interest rates partially contributing to low investment yields on commercial property investments, there remains strong demand from property investors to buy surgeries. These factors have led to an increase in sale and leaseback transactions over the last 12 months. Super Practices are now beginning to emerge. I have been involved in discussions as to the formation of Super Practices and how property is to be treated. This does depend very much upon the tenure of the various surgery properties, with it typically being a mixture of freehold and leasehold surgeries. Certainly there is not a “one size fits all” answer since this will depend on the mix of property types, together with the tenure of each property and the age profile and dynamics of the Super Practice. Rental growth has been limited in recent years but there does seem to be a chink of light with there being modest levels of rental growth. Caution should be heeded since there are still relatively few rent reviews that have been settled in recent years – a significant number more rent reviews are yet to be concluded. Development of new surgeries is gathering pace due to the implementation of the ETTF and there being pressure for these schemes to be delivered. The original deadline was to be March 2019, however there seems to be an increasing realisation that this deadline is not likely to be achieved in most instances and speculation that this deadline is to be extended. Part of the frustration in delivering new medical centres under the ETTF is knowing how the capital contribution from the NHS is to be paid and the timing of such payment. Even though the NHS had “allocated” money for proposed medical centres, this is not “approval” and it transpires that further business cases are required in order to progress from allocation to approval. My hope for 2018 is that this process will be streamlined in order to ease the delivery of new medical centres and extensions to premises funded under the ETTF. The future of various organisations such as Clinical Commission Groups is open to much speculation as the Accountable Care Organisations (ACOs) and Accountable Care Systems (ACSs) and the Strategic Transformation Partnerships (STPs) come to fruition, combined with the other acronym of Local Care Experts (LCNs). In summary, the future landscape of the structure of primary care is an interesting subject, but despite speculation of much change, there is always going to be demand for primary healthcare. The challenges regarding funding are likely to be a permanent feature and there will need to be innovative thinking to overcome this if we are to bring about transformation in healthcare delivery. Wishing you all a most enjoyable Christmas.